Women all over the world play a critical role in providing food and education as well as ensuring the well-being of their families and communities. But often, their contribution goes unrecognized. This is the case for women farmers in many regions of the world: they work and manage the land, but very often they are not entitled to own or inherit it. They can use the land, and work on it and work for others but more often than not they have no rights to own and run a farm. They can easily lose their rights to even work, if their husbands die or the landowner takes away land to grow commercial crops. As part of the continuing focus that Global Forum on Agricultural Research (GFAR) places on gender in agriculture, it co-hosted a session at the fifty-ninth session of the United Nations Commission on the Status of Women. The session on “Strengthening women’s access to land and productive resources improves food and nutritional security” was aimed at raising awareness of the need for women farmers to have secure access to land and to be able to retain some control over it in order to increase food production and raise their incomes to provide a better life for their families. The event was chaired by Prof. Catherine Bertini, a Distinguished Fellow in Global Agriculture and Food at the Chicago Council on Global Affairs and co-Patron of the multi-partner Gender in Agriculture Partnership, which is facilitated by GFAR and now brings together over 250 organizations. GFAR was instrumental in bringing two farmers’ spokespersons active within the Gender in Agriculture Partnership – Ms Alice Kachere from Malawi and Mr. Ireneo Cerilla from the Philippines to the event. Both spoke eloquently about their experiences in advocating for women land rights. Mr. Ireneo Cerilla, from Quezon City in the Philippines spoke of his involvement leading PAKISAMA, a national confederation of small farmers, fishers, and indigenous people’s organizations in 43 of 80 provinces in the country. Ireneo is an active farmer and member of the Asian Farmers Association (AFA). He works avidly for the rights of everyone to own land. 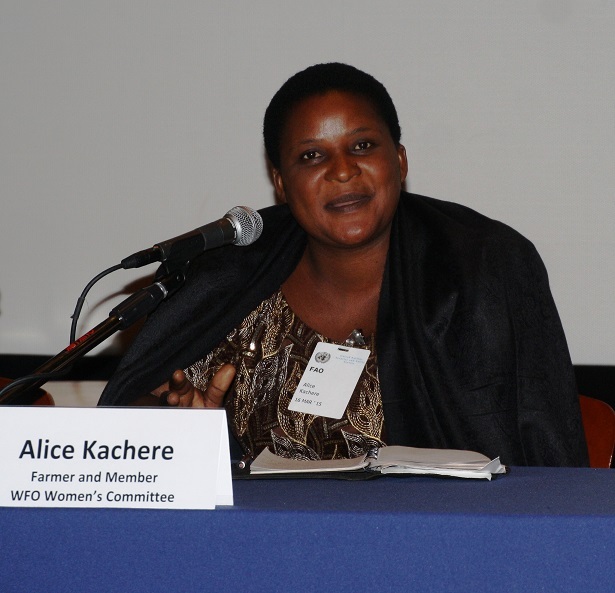 Ms Alice Kachere, is an active member of the World Farmers Organizations (WFO), who lost her land, lost her home and the means of subsistence for her family when her husband died. Her fate was to eventually change as she took up farming and became a member of a farmers’ organization working towards uplifting the livelihoods of small-scale farmers in similar situations. Today, Alice is a member of the Women’s Committee at the World Farmers’ Organization. In her intervention, Alice stressed the importance of addressing the issue of land rights in the broader context. “Without the ownership of the land, women are not granted access to credit, therefore they do not have the money to invest in technology and be competitive on the market” stated Alice. She went on to add “In this framework, farmers’ organisations play a critical role”. Women have many different roles in society but social norms and policies impact their achievements and often marginalize them. But there is robust scientific and empirical evidence now that when women oversee assets, they are better managers and allocate resources more effectively and are more productive. Land ownership confers direct economic benefits: as a source of production and income; and collateral for financial and credit services. Land policies must be codified to protect the rights and investments of women. Research shows that the outcomes from women’s access to resources in general can enhance yields by 20 to 30 percent, which translates to 2.5 to 4 percent gain in agriculture output. Such improvements would reduce the number of hungry people in the world by 12 to 17 percent. When women control income, they are likely to spend more than men on social welfare needs for their entire families such as food, health, clothing and education for their children. Closing the Gender Gap in agricultural inputs would lift 100 to 150 million people out of hunger and social insecurities. This meeting was fruitful in showing our commitment to the Beijing Declaration and the drive we have in closing the gender gap. The draft resolution outlines the concern that we have not achieved all we set out to do, but also shows our recognition of the work we have ahead. We pledge concrete action to ensure full and accelerated implementation of the Beijing Declaration. The message is clear: If you increase a woman’s income you then can increase the education of her children and too this will lead to improved nutrition and livelihoods. This is a direct knock-on effect.